Before we get to the theme of this month’s ride we need to explain what a ghost bike is. A ghost bike is a bike that is painted white and decorated as a memorial to a fallen rider. This month our route will be passing a ghost bike. 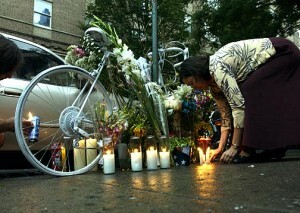 If you want to bring a candle or a flower to leave at the bike you should. 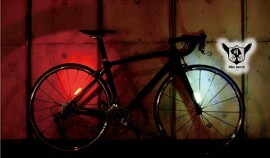 You can find out more about ghost bikes by visiting ghostbikes.org…. This months theme is the Rocky Horror Picture show. Dress as Transylvanian transvestites and do the Time Warp like they did in the show. 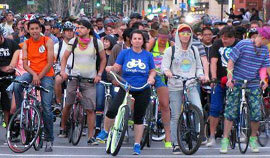 Be safe, legal, and courteous (see How We Ride!). We share the road with other traffic. Helping cars move through smoothly makes the ride more enjoyable for everyone. Do your part to encourage good behavior! Also, please remember to turn down the volume when riding through residential areas late at night. Zoomable Online Route Map — Study Me! Printable Turn by Turn (coming soon) — Print Me! See comments for details on the feeder rides listed below. Palo Alto — Led by Andrew – Meet at Lytton Plaza at 6:15pm. Willow Glen — Led by Rise – Meet at KFC, Curci and Meridian. Rolling at 6:30pm sharp! West Campbell/West SJ — Led by Gary – Meet at Kirkwood Plaza Shell station (Campbell Ave. & San Tomas Aquino Rd.) around 6:45pm. Rolling by 7:00pm. Los Gatos — Led by David – Meet at Office Depot (Los Gatos Blvd at Lark) at 6:20pm. Leaving at 6:45pm.